Increase the protection of your chemical and pesticide storage with a cool, well-ventilated pesticide storage building. Pesticide storage buildings should maintain a safe and compliant storage atmosphere for your inventory. Mechanical ventilation can decrease internal temperatures and help eliminate toxic fumes or dusts that pesticides or other chemicals can give off while being stored or handled. Excessive heat or freezing temperatures can damage costly inventory, creating pesticides to ignite or even explode. Temperature controlled pesticide storage buildings can eliminate temperature fluctuations and extreme temperatures that can decrease the effectiveness of chemicals and pesticides. Pesticide storage buildings also provide protection from exposure to direct sunlight, which can cause damage to inventory. Pesticide storage buildings by US Chemical Storage offer a safe storage solution for maintaining chemical and pesticide inventory. Only store pesticide containers, a spill cleanup kit and limited compatible materials inside pesticide storage buildings to remain completely safe. Pesticide labels must be able to be read and placed in plain sight. If labels are torn, ripped or destroyed contact your local environmental agency or request a replacement label from the manufacturer or dealer. It is necessary that all information illustrated on the label is read thoroughly and understood, prior to storing. It is recommended to take inventory to ensure pesticides are not old or contaminated. Be sure to note inventory shelf life to avoid storing old chemicals. 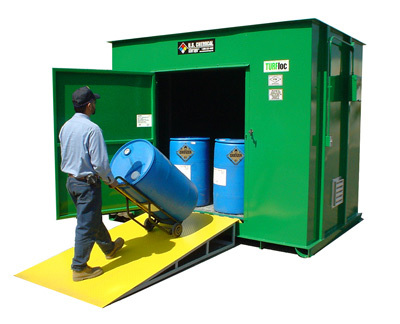 To avoid contamination or hazardous accidents, pesticide containers must be securely closed when not in use. Open containers are more likely to cause leaks, spills and hazardous accidents. Organize pesticide storage with metal shelving and racking systems for increased organization and a safer environment. Place lighter containers on the top shelves and the heavier containers on the lower shelves to avoid hazards. Store incompatible pesticides in separate rooms segregated by solid partition walls. Utilize fire-rated partition walls for flammable pesticide storage. Increased protection from harmful hazardous materials. Protects pesticide storage from temperature extremes, moisture or other weathering elements. Keep pesticide inventory safe and protected. Pesticide storage buildings by US Chemical Storage meet EPA, OSHA, NFPA regulations and FM or Warnock Hersey approvals.